Sunglasses are a must have accessory for every girl. It not only protects your eyes from the sun but also look trendy at the same time. Oh and they totally hide your dark circles and droopy eyes on the no-makeup days. We all know that finding the perfect pair of sunglasses isn’t always easy. If you are like me, you also have a few sunnies that you don’t use as they do not suit your face. You must have stood at the counter looking and searching for the perfect pair many a times but something just doesn’t look right. So, just to make your struggle a little easier, here are some tips and tricks that will help you find your perfect pair of sunglasses for your face shape. Now, this is the first and the most crucial step. Majority of the girls have trouble in figuring out their face shape. The most accurate way of knowing your face shape is to tie your hair in a neat ponytail and then trace the outline of your face with the help of a dry erase marker on a mirror. Step back and you can clearly identify your face shape. You will either have a round, oval, square, heart or diamond shaped face. If you have a face with fuller cheeks and a rounded chin then you very clearly have a round face. A round face is basically equivalent in its length and width. So, if you have a round face then you should pick geometric frames rather than going for rounder ones. Sunglasses that are slightly wider than your face and are more angular will suit you the best. Square, rectangular and cat eye sunnies are the different types of frames that will define your face a lot better. Also, round sunglasses are an absolute no-no as they will make your face look even more round. Celebrities like Selena Gomez and Kristen Dunst have a round face and you could look just as fabulous if you play around with the right designs. Just like Olivia Wild, Jennifer Garner & Angelina Jolie, a square face has bolder features and a strong jawline. You already have a sharply defined face shape and therefore to balance it out, you need to go for more soft rounded frames. Instead of opting for square or rectangular frames choose oval shaped sunglasses like aviators. Also, oversized sunglasses with rounder edges flatter square face shape the best. 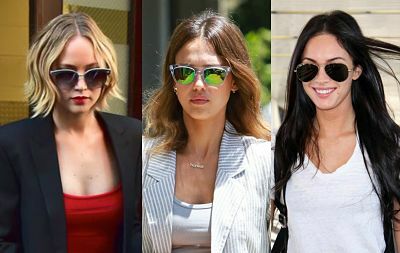 How to choose sunglasses for heart, oval & pear face shape? A heart shaped face is similar to a diamond or an inverted triangle. People with a heart shaped face usually have a broader forehead and a narrower chin. If you have a heart shaped face try to avoid sunglasses with a narrow design or even the heart shaped frames for that matter. Round, cat eye, wayfarers and butterfly sunnies will work the best for you. Sunglasses with a wider bottom frame and a narrower framing on the top will also help define your face in a more flattering manner. Celebrities like Rihanna, Kendall Jenner, Reese Witherspoon and Miley Cyrus are the best examples of a heart shape face. An oval face is usually longer with the forehead being slightly broader than the jaw. 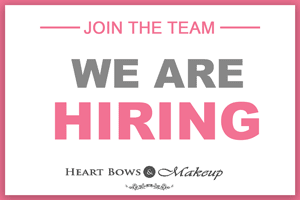 If you have an oval face, you are one of the very lucky ones because you can work with pretty much everything. You can rock all the designs from aviators and cat eye sunnies to over-sized ones. The only thing that you should keep in mind is to avoid sunglasses that are bigger in width. 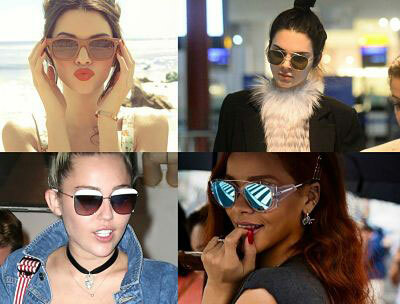 When it comes to the shapes and sizes of sunglasses the oval face is the most advantageous one. 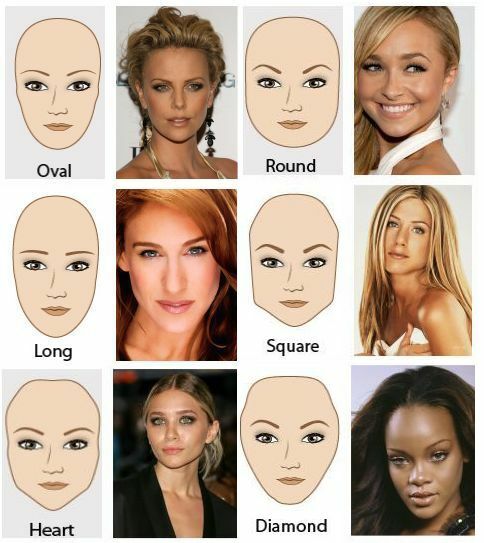 The most famous celebrities with an oval face shape are Meryl Streep and Jessica Alba. We have often heard of pear shaped bodies but a pear shaped face? Yep, that’s a face shape too. A pear shaped face is similar to a pear shaped body and is very rare. There are a number of similarities between a pear shape and a round face. However, a pear shape face will have a broader jaw and a comparatively smaller forehead. Now, if you are one of the very rare people with this face shape, then you need to divert the attention away from the bottom half of your face. Take cues from singer Kelly Osbourne and make over-sized and cat eye sunglasses your best friends. The smaller designs will just exaggerate the lower portion of your face and should be avoided. Now that you know about the different face shapes and sunglasses, go ahead and find the perfect pair of sunglasses for your face. Whatever your face shape maybe, don’t forget to step out of your house with confidence.